Chevy’s Camaro ZL1 is amongst a limited breed of muscle cars that are making its way to the top of the North American powerhouse food chain. The ZL1 puts down a solid 650 hp, sprints to 100km/h in 3.5 seconds, and covers the quarter mile in a mere 11.4 seconds. This puts the Hellcats right in its targets, and we are awaiting more details on Fords’ GT500 which looks to be in its development and testing phase right now. When you show a kid a picture of a Camaro, it’s quite common that their first reaction is yelling out the name “Bumblebee”. Ever since the first installment of Michael Bay’s Transformers franchise hit the big screen back in 2007, the Chevrolet Camaro has since been linked to the image of a robot car. No official details have yet been released on the new iteration of Bumblebee Camaro except these images. But what we’ve been accustomed to is a widely reimagined version of the factory car when it makes it way to the screen and this iteration is no different. The body work of the Transformers Camaro is aggressive in design with low hanging front splitters and an aggressively shaped front valence. The splitters continue down the side and the rear gets a big wing. 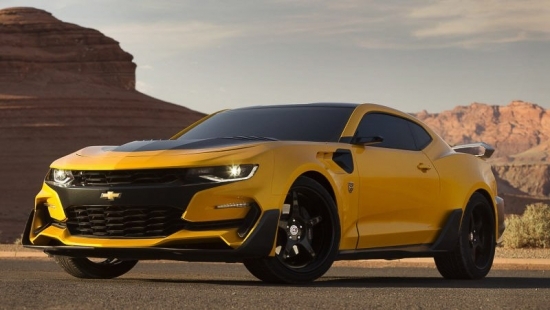 When the movie officially launches we’ll get many more details of the Bumblebee Camaro. 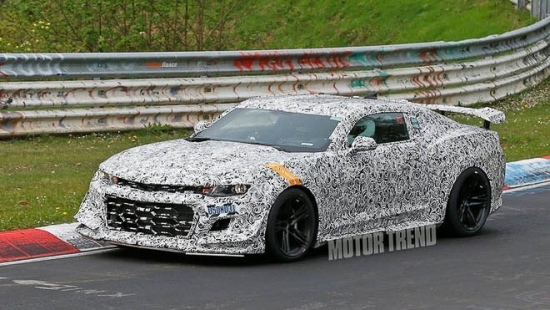 The latest generation Camaro has been spied during testing and what an amazing looking piece of machinery it is, even under heavy camo. From what we can tell, the body styling is very aggressive with the next generation. I think it looks like a street legal NASCAR with the aggressive body styling with all those splitters and winglets. And we wouldn’t be far off to guess that it’ll pack something equally as impressive under the hood. The last generation LS7 was a god send of a 7.0L small block V8. Spied footage out there suggests that the next generation will continue to be naturally aspirated. With it’s competition already belching out around 530hp, we think that all new Camaro will definitely push out somewhere north of that number, just to be a bit better than the others. Ever since the muscle car race started in the 60’s pitting the likes of Chevy, Dodge and Ford against each other for a power struggle of biggest muscle, each manufacturer has created sport coupes in an attempt to out gun the other. 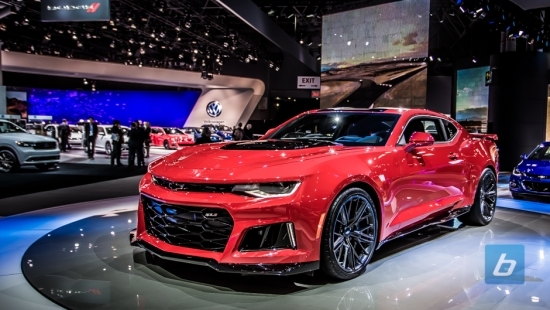 We are all familiar with Dodge’s entrants with the 707hp supercharged 6.2L V8 Hellcats, well now Chevy takes to the New York Auto Show to unveil their contender, the Camaro ZL1. On paper, this is going to be a close race. 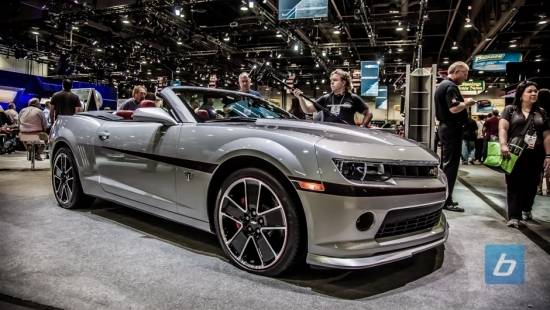 The Camaro uses the Corvette Z06 motor which has been massaged to churn out 640hp. Camaro’s advantage is its thinner waistline. It is roughly 500 pounds lighter than the portly Hellcats. That equates to a power to weight ratio in Camaros favor. The Camaro will be using GMs all new ten speed automatic transmission, but can be packaged with a six speed manual as well. 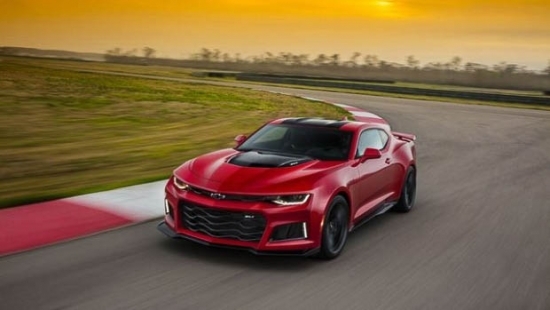 The new transmission is designed specifically to handle the large power output of the Camaro, as well as tuned specifically with exacting shift points to get the most out of the ZL1’s engine. The all new Camaro ZL1 is generating a lot of talk around it’s new progressive styling. Some may say it’s a departure of all things classic about the American muscle car, but others may say it’s just part of evolution. I take the side of the latter. But regardless of which side you stand on, there’s no denying the fact that the new Camaro ZL1 is a potential Hellcat slayer. Chevrolet is set to officially debut the car at the upcoming New York Auto Show, but information about the car has already leaked all over the internet. Under the hood will be a 6.2L V8 that’s supercharged and good for 640hp and 640lb/ft of torque. The motor is essentially a tuned version of the Corvette Z06 and Cadillac CTS-V’s motor. The American company is doing something that most manufacturers today aren’t doing, sticking a standard transmission to an immensely powerful motor. They will also produce a 10 speed auto gearbox as an option for those who want it. Getting back to the looks, the ZL1 is full of wide body work, sweeping body lines, vents, and LEDs. All of which comes together in unison to create a very visually appealing package. 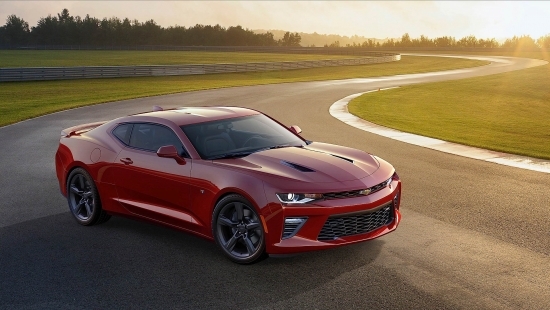 The overall physical prescience of the ZL1 is muscle and performance. The car also features an intake/vent hump on the hood line which looks to be a separate unit from the hood itself. Regardless of how this new Camaro gets received by the public, one thing we do know is that it’s a potent package and major competition for Dodge and their Hellcats. Happy hunting! The all new sixth generation Camaro will again be offered in the 1LE package. The 1LE designation may be lesser known to car buyers, but what the badging refers to is a “Performance on the Track” package and will be offered with both V6 and V8 options. The 2017 model will be debuting at the Chicago Auto Show. The 1LE is all about being able to take a street car right on to the track and most importantly be able to record faster lap times than the stock Camaro. This is all done by focusing on three things, grip, handling and cooling. The 1LE package has a specially designed aero package that helps to generate more downforce on the track. The suspension has been beefed up to help in the handling department. Larger brakes are used to help the car maintain better braking performance throughout the track day, and better ventilation and air channeling is utilized at the front to bring more cool air through the engine bay. Throughout muscle car history, automakers have produces a variety of optional packages for customers to choose to build their own dream cars. The LE1 package is just one of many choices in the Chevy options department. The most interesting one in this year’s offering is still a V6 engine choice. Although lacking in power compared to its V8 counterpart, the LE1 V6 package is uniquely combined together to make the car drive and perform at it’s peak ability. I for one love the sound of a good American V8, but honestly Chevy’s V6 bellows out quite a note as well. 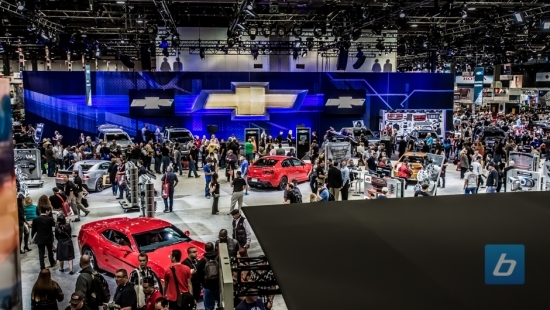 Each year at the SEMA Show, Chevy sets up a big booth in the central hall and packs it with their fleet of cars and trucks including the Corvette, Camaro, Colorado, Silverado and even the compacts are represented with the Sonic. 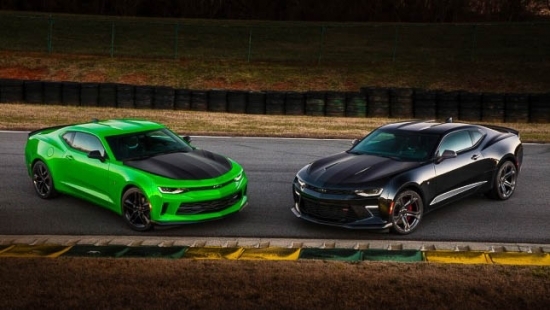 For this year, Chevy bid adieu to the current generation Camaro with a couple special edition Camaros. They actually enlisted the help of their fans to help name their special edition Camaro and what has the internet come up with for the #NameThatCamaro contest? 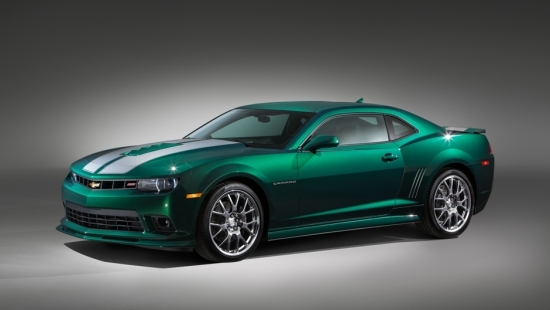 From now on, the 2015 Special Edition Camaro will be known as the Green Flash Special Edition. In order to confuse thing even further though, they also had another special or rather, commemorative edition Camaro dressed in silver with a wrap around stripe which you can see below. With so many cars in their booth its tough to mention them all but they also had on a hand the 2015 Chevrolet COPO Camaro Concept of which only 69 copies will be build. Check out the rest of the pictures in our gallery after the break! 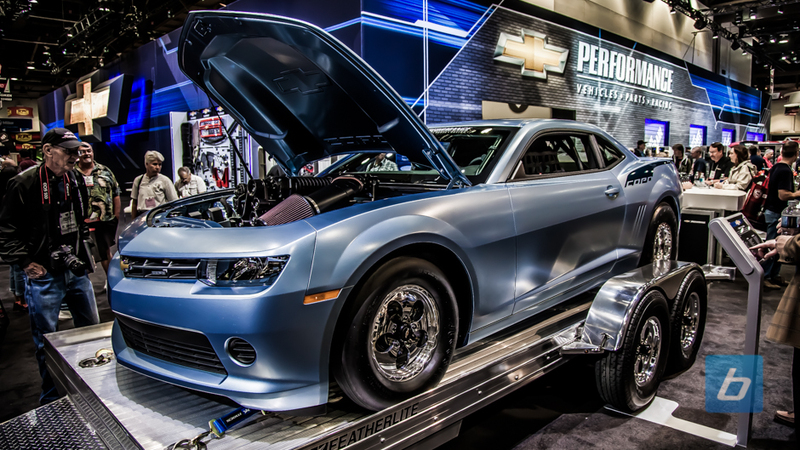 SEMA 2014 is just around the corner and Chevrolet wants your help to name its new Special Edition Camaro SS that it will be unveiling at the show. The new Special Edition Camaro SS will be arriving at dealerships early next year wearing an exclusive Emerald Green Metallic exterior color along with other unique exterior features. The Special Edition Camaro SS will be available in both coupe and convertible models and in addition to the exclusive paint job, will include the RS appearance package including HID headlights, LED taillights, RS specific front grille, paint matched roof mouldings and antenna and dark chrome 21″ wheels. It will also come with a body-colored SS hodo extractor versus the standard black finish. All models will feature a black interior with graphite silver door panels and instrument panel inserts. Those opting for the convertible will get a black top. Performance comes from a 6.2L V8 rated at 426 horsepower and 420 lb-ft in models with the standard six-speed manual transmission, and 400 horsepower and 410 lb-ft for models equipped with the available six-speed automatic transmission. Suggestions can be submitted at twitter.com/Chevrolet and at facebook.com/chevycamaro, using the tag #NameThatCamaro. Here are my suggestions: The Hulk, Green Hornet, and Envy Green :) Check back for pictures of this Camaro from SEMA early next month! If this sounds familiar, last year we were asked to help name the blue paint on the Dodge Viper shown at SEMA 2013. Chevrolet’s booth was almost always buzzing with people eager to check out their vehicles and speakers. We toured the booth numerous times hoping the crowds would die down a bit but each time, if it wasn’t a press conference it was Danica Patrick on the stage doing a Q&A. In the end we managed to get a decent collection of shots together for the Chevrolet booth, including the 2014 COPO Camaro pictured above. Only 69 are going to be produced for the NHRA Stock Eliminator and Super Stock competition. The first one off the production line will be auctioned off by Chevrolet Performance at Barrett-Jackson’s annual January event in Scottsdale. Other noteworthy vehicles in the Chevrolet booth included the Silverado Cheyenne Concept truck which always had a people around it marvelling at all the carbon fiber out back, as well as the blue C7 Corvette Stingray. Yeah, there were literally hundreds of C7 Corvettes at SEMA, but this one in particular is headed to a PS3 console near you. It is the Gran Turismo Edition Corvette Stingray and will be a playable vehicle in GT6 coming out in December.